In an age where confidence is praised and the right of the individual is rightly prized, it is easy to forget that the ego is a fragile thing, prone to inflation and deathly afraid of punctures. Ego is the Enemy (2016) is here to provide a reminder of a most inconvenient truth—that sometimes our sense of self just needs to quiet down and take a back seat if one would like to actually get things done. 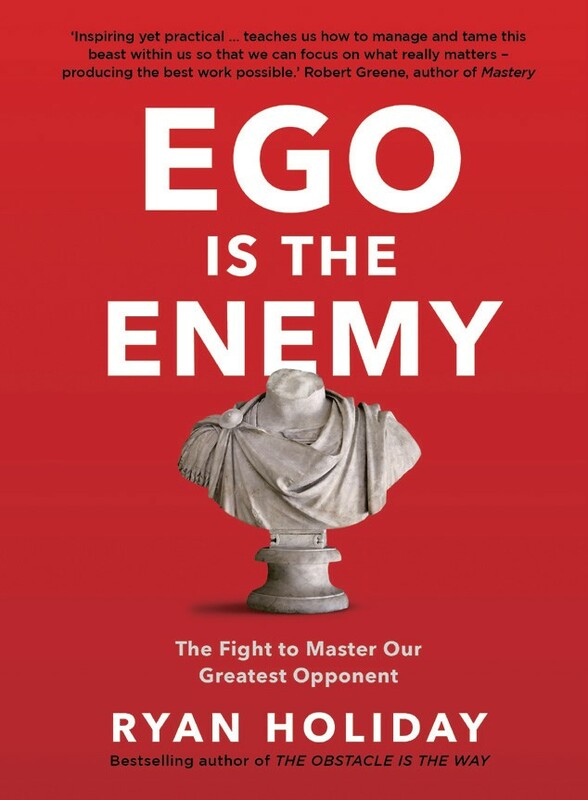 Perhaps it is fitting that a book on ego—Latin for I—should be threaded through with wisdom straight from ancient Rome and Greece. Ryan Holiday’s Ego is the Enemy (Ego) jumps centuries of time, beginning with Xerxes and then mentioning Angela Merkel only a few chapters down. Holiday does a capital job of pointing out the failings of the sense of self, of why so many try only to tear down what they have started. Dislike of hard work and complacency once success has been reached are two of the reasons—just two facets of the vicious side of ego. To burst a bubble, one must first procure a needle. Holiday’s plain language in Ego serves as a fine point for a sturdy needle shaft—the latter being the wide variety of examples an experienced businessman and aficionado of classical thinkers has to offer. Although the sentences are not exactly Shakespearean, their brevity helps the reader see ego for what it is, as well as what it actually does; “After we give ourselves proper credit, ego wants us to think, I’m special. I’m better. The rules don’t apply to me.” Holiday’s book is littered with the downfalls ego directly causes and the good things that come when one avoids feeding it. Most are surprisingly relatable considering the prominence of many featured in the examples, such as failed entrepreneur Howard Hughes and the selfless General Marshall. As Holiday puts it in the book’s introduction, “Our culture fans the flames of ego.” His observations can be applied to Korea; the goals of Korean children are “finding a good college” and little else. There will still be trouble even for those who accomplish that goal, and effort will be more important than ever on the journey ahead. Ego is here to help one face the facts and banish the sense of self that will interfere with said journey— “Oh, you went to college? That does not mean the world is yours by right…there will be: slights. Dismissals.” Holiday’s advice may not be an easy one to swallow, considering that the bulk of it consists of patience in the face of raging emotions. Still, everyone needs bitter pills, and that is what Ego dispenses. The writing may come off a bit forceful at times; this is not just because the lessons of this book is a particularly bitter pill. Holiday is quite familiar with the trappings of ego. Having experienced fame and its fizzling, having seen a prized work disintegrate, Holiday knows well how ego may lead a person to react badly in such situations. Conviction, and that touch of urgency good teachers have, are palpable in Ego. Having a bubble to burst and nothing to burst it with will not do; being caught up in feeling good about oneself, trying to shelter the ego from failure through not trying at all, is a situation that badly needs correcting. No matter what ego might say, work and failure are unavoidable aspects of life. The only answer is to face them with equanimity and humility. Knowing that so many instances of stagnancy can be traced back to the petulant child called ego, one is better equipped to fight when adversity rolls around—and everyone knows how easy it is to quit, to avoid failing by not even trying.